Check-in & Logistics: Check-in was easy. A nice gentleman with a megaphone directed you towards the “death waivers” and cajoled you with the fact that this was going to be a very tough thing to do. It was great. The second you get in, and they are already setting the festive atmosphere. The check-in process itself was smooth with the usual alphabetical lines that were clearly marked. After you received your packet, you hit the face painting section to get your number painted on your forehead for easy identification should you die. The Schwag: Shwag? What shwag? Pansies that just signed up received a free beer bracelet (Dos Equis), but Tough Mudders that actually finished the race get a t-shirt, headband, and some much needed hygiene products. 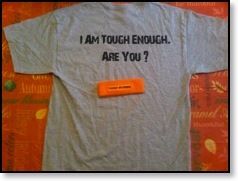 Now, the kind-heart in me would like to see everybody that at least attempted the course get a t-shirt. 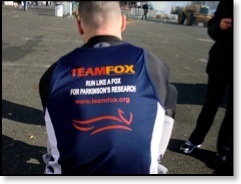 Perhaps have two t-shirts: one for participating and one for finishing… The participant t-shirt and finisher medal approach also works. 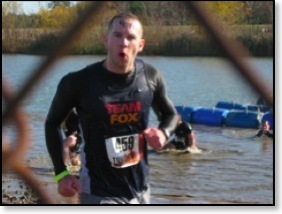 The Race: This race was an assault on your senses that so far has been unmatched in my short Adventure Running career. 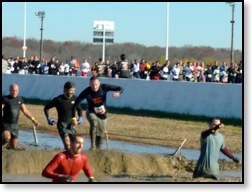 The hardest sense hit was my common sense for signing up for an event featuring water obstacles in New Jersey in late November. Really. What was I thinking? The race starts off in a large raceway dragstrip with music blaring to pump you up. The MC hits the mic to get you even more psyched for the event. After whipping everybody into a frenzy, the countdown begins, and you chase a monster truck down the track through thick smoke. This event was running-heavy since it was 12.1 miles, and you didn’t even get out of the start area before completing your first mile. 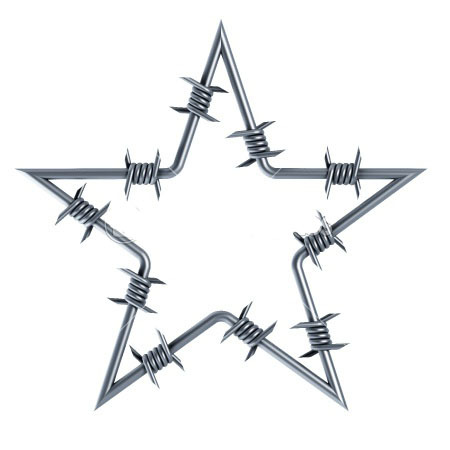 I was beginning to wonder when the first obstacles would appear, and after another 1/2 mile or so, I was wishing they’d held out a little longer. The first obstacle was a waist-deep wade through freezing cold water followed shortly by the “ball shrinker”, which is two ropes suspended over the water that you have to balance across. Shortly after that, you are greeted with a rope-aided climb onto a 15’ high platform that you jump off into the icy cold water. That was something I certainly didn’t train for. The second you hit that water, it’s like a swift kick in the gut as the air is driven out of your body. With quickly numbing limbs, you struggle to the surface for some air and then have to start your swim to the other side. I give the GoRuck guys huge props for doing that with weight on their back. Truly. Way to go. When you get to the other side, it’s not over either. You have to bob underneath barriers blocking your way. It sounds easy, but staying underwater even a few second is tough at this point because of the extreme cold and your exhaustion. Think that’s it? 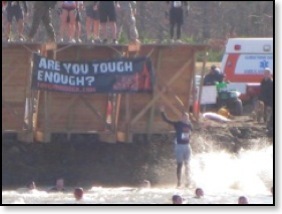 You obviously aren’t a sadistic SOB like the Tough Mudder course designers because after a very short jog, it is back into the drink with you to swim to the other side. 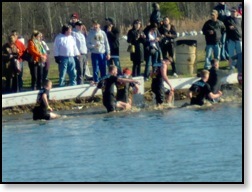 After freezing your tail off in the water, you do a bit of running until you get to the cargo nets. I’m pretty sure you’re already 3 miles deep at this point and already past the distance of a lot of these races. The nets were a little anticlimactic compared to some other cargo nets I’ve come across, but no cargo nets are really easy to get up. 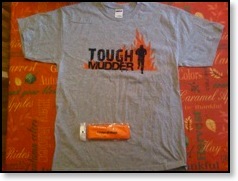 You run a little bit and get to the “mud mile”. I hit this flying and was starting to pass people in the muddy, knee to waist high water and while going over the slippery, steep mounds that broke up the obstacle. By the time I hit the last section, I was toast. It didn’t get any easier from there either as you’re out into the motocross track. I’ve done steeper tracks before in other races, but they had the sprinklers going at full tilt over nearly every track section. The mud was deep and every single hill was slippery. All told, I think there were 5 miles of track sections. The “cliff hanger” section was particularly tough. It was a large, steep, slick, and muddy hill that you had to charge up. I stopped for a minute to come up with a strategy, and I watched a few people try and fail to make it up. There was a team on one side that appeared to be helping their teammates up, so I just went for it up the other other side. I charged as hard as I could, and I ended up making it all the up on my first go. That was probably the highlight of my day. After this initial motocross section, you hit some tunnels, followed by the Berlin Walls. I was out far enough ahead of the pack where I didn’t have to wait at all except when I waited to make sure a fellow Mudder could clear the wall on his own. 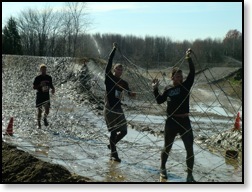 Then you hit another cargo net climb, and it was off to the races… literally. 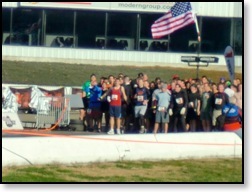 You came to another race track where you were greeted with a sea of tires (Tired yet) to run through. I won’t lie. I bought it once here. 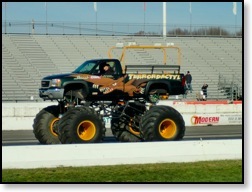 That was shortly followed by “rubbernecking” where you had to shoulder a tire and run around the track with it. 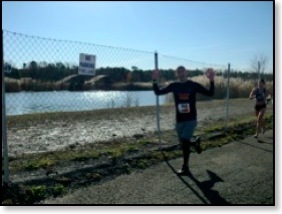 It was at this point that I saw the “Mile 7” sign, and I knew I was going to finish strong because I had a lot left in my tank. To be honest, I was really having a blast. I think I smiled from start to finish. 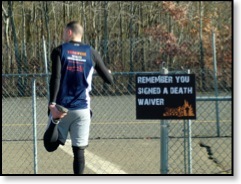 It was a quick jaunt after that sign to the Tough Mudder signature obstacle: the fire run. Don’t get me wrong. It was cool to run surrounded by bales of burning hay (and a welcome relief from the cold), but this wasn’t so much an “obstacle” as an experience. 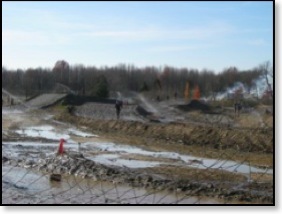 More motocross track sections followed until you hit “devils beard”. 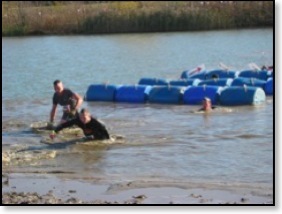 This was a cool obstacle as Mudders helped each other through. I held the exit open for a nice guy I ended up spending the next couple miles racing with and talking to in between exhausted gasps for breath. Once through that net, it was off to the “log bog jog”. This was another underwhelming obstacle. It was just a woods run over a couple fallen trees. Not that I was complaining at this point seeing as we were 10 miles deep. This part was punctuated by long flat runs until you hit the monkey bar/balance beam combo obstacle (twinkle toes). I must say I am embarrassed, but I could not clear those monkey bars to save my life. I fell once, and then I tried again only to fall a second time. My hands were just so fried from the cold that couldn’t maintain my grip. I can knock out 20+ pull-ups at a time, and I cleared monkey bars easily at my last event, but I just wasn’t tough enough here. Oh well! 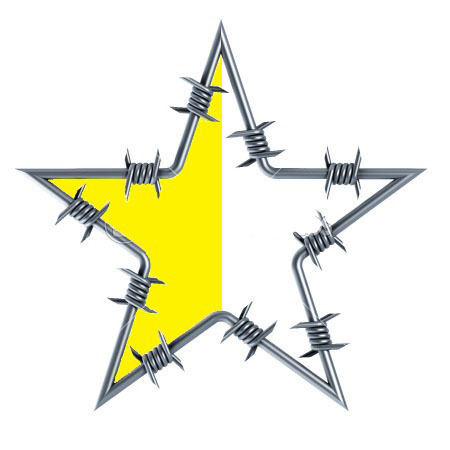 Something to aim for next time out. Big props to everybody that did clear them! After the monkey bars, you hit some tunnels again before coming back into the stadium for your victory lap. The “mystery obstacle” awaited, which was a run through dangling, live electrical wires we were told. I figured that was just a psyche out ploy, and it was nothing. I begin to run through the wires thinking “see? I knew they were full of it!” when WHAP! It felt like I was punched in the head. I guess some were live after all! 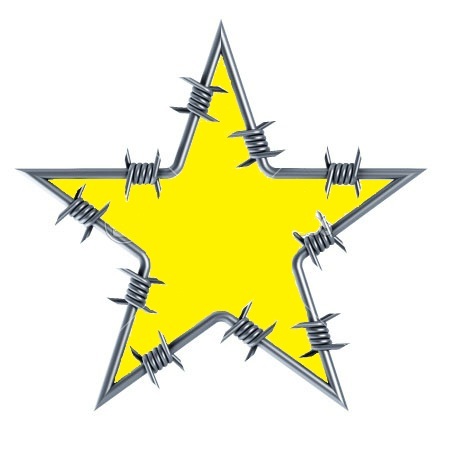 You quickly loop around onto the final stretch run of the track where the “insane bolt” obstacle was supposed to be. Nobody said to stop and people were just jogging through, so I decided to do my own 100m sprint… I likely failed the 20 second mark at that point. I did finish in under 2 hours though, and I had a blast doing it. The Verdict: Right from the get-go it was apparent the Tough Mudder was an event that has been around for longer than the others I did. It was polished from start to finish. The atmosphere was fun, upbeat, and friendly, and the race itself had some really intense parts. 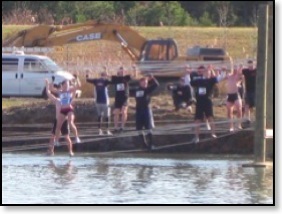 They could do with upgrading some of the obstacles, but overall this is was an awesome event. I would run it again in a heart beat. It would also be nice to have some sort of timing added to these events. I don’t think it would take away from the spirit of camaraderie that permeates the event even a little. It’d be nice to see how you stacked up and to make sure nobody undeserving gets into the championship. Lying is lame, but if competing in submission grappling taught me anything, it’s that people lie to “sandbag” their way to wins. It’d be lamer for an undeserving person to get a spot over a deserving one. After the race, I gathered with racers around the much needed bonfire as we exchanged tales of misery over a cold brew. The band was keeping us entertained as were the Dos Equis girls walking around and mingling. I was disappointed that I had to bail early for the 5+ hour drive home. It seemed like it would be a really cool after party. I guess I’ll have to make sure to do the Saturday event in May at Mount Snow.